Let Skirmish Dorset take you into the wilderness- the hunt is on! Each team will be briefed kitted up- your commands are simple – find the opposition – eliminate them – blow up their base and take no prisoners. Our HQ (safe zone) is positioned in the middle of our woodland with more than 20 game fields extending out from it. Once you have been shot, make your way back to the HQ for free refreshment and big stories….Back in the HQ you will be briefed on your next mission, then taken by your marshal to the next game zone. 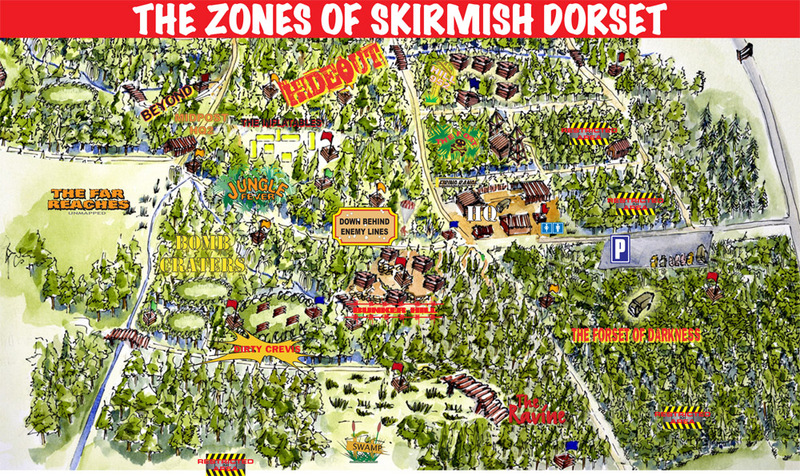 Each zone has been prepared and landscaped specifically for Skirmish Dorset Paintball Games. Beyond our many game areas there are other playing fields that not everyone is invited to play. The woodland becomes dense and your bearings become confused – getting lost is easy! From your base camp your mission is to find the opposition eliminate them – but where are they? With little help from our game marshals you will need to use your cunning and your wits to find and outsmart them. Amoungst the 20 game areas, run open clearings to dense woodland with streams and gullies. You can hide in trenches, blow bunkers, climb towers and storm bridges which are build into the natural woodland.